Journey into the amazing world of Hindu mythology with Devdutt Pattanaik • Why are most temples dedicated to Vishnu Shiva or the goddess but not to Brahma or Indra? • How are an asura rakshasa yaksha and pishacha different from each other? • Why did the Pandavas find themselves in naraka rather than swarga? 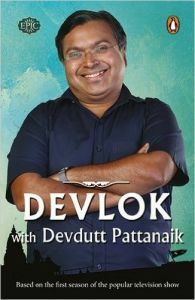 Over several months EPIC Channel's ground-breaking show Devlok with Devdutt Pattanaik has enthralled countless viewers. Here finally is the book based on the first series of the ever-popular show which will take you on a scintillating tour through the myriad stories symbols and rituals that form the basis of Hindu culture. Prepare to be surprised and thrilled as Devdutt narrates magical tales about larger-than-life figures--gods goddesses demi-gods and demons who you thought you knew well but didn't. Learn about the intricacies of Hindu thought as he explains the origin and meaning of different creation myths and throws light on why we believe in a cyclical--not linear--concept of time. This book is your perfect introduction to the endlessly fascinating world of Hindu mythology. Devdutt Pattanaik is the author of over twenty-five books and 500 articles on the relevance of mythology in modern times. Trained in medicine (MBBSfrom Grant Medical College Mumbai University) he worked in the healthcare and pharmaceutical industries for fifteen years before devoting all his time to his passion for decoding beliefs of all cultures modern and ancient located beneath the veneer of rationality. To know more visit devdutt.com.